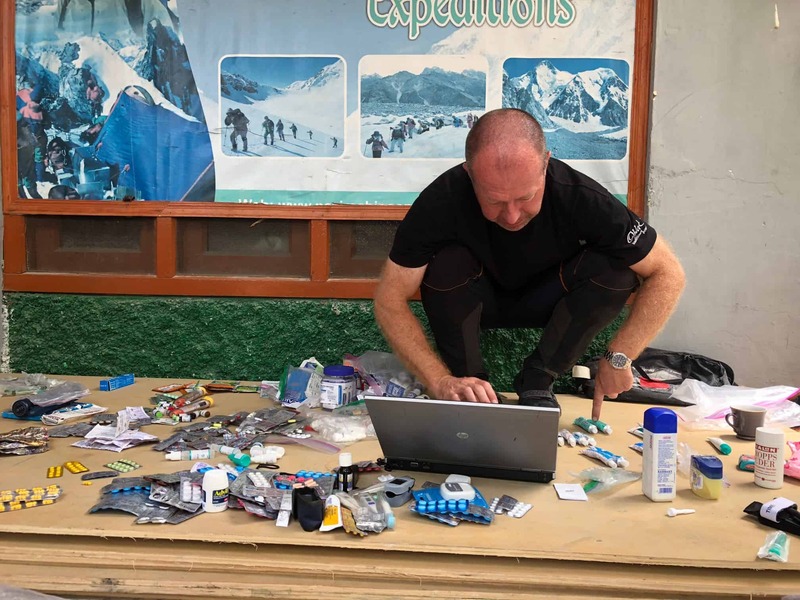 A busy day today in Skardu – sorting kit and prepping loads for porters. Everything that we’re taking on the expedition has to be collated into separate loads of no more than 25kg, which is the maximum allowed weight for porters. To think that this doesn’t include any of their personal kit (which whilst not a lot, will still be another 5-10kg), it means that they’ll be carrying around 35kg for 120km over 7-8 days up one of the longest glaciers in the world. I’ll certainly write more about them in future posts, but they really are incredibly hardy. 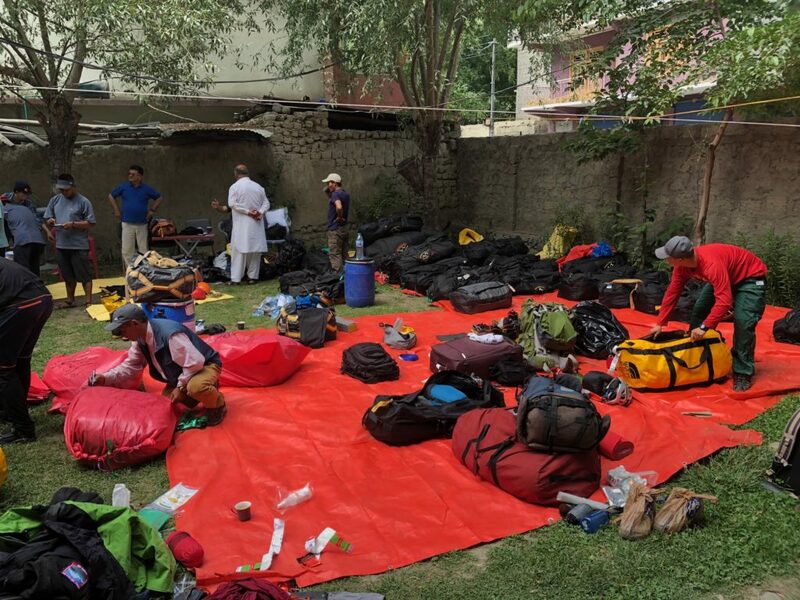 The team split down a little today, with the trekkers (who don’t really have much of their own kit that needed sorting) heading out on a tour of Skardu, whilst the climbing team and the Sherpas sorted all the gear. I’m afraid to say that I have an embarrassing amount of kit that I’ve brought – which won’t come as much surprise to those who know how I like to overpack, but in total I have 6 bags weighing around 150kg. In my defence, one of them is a huge Mountain Hardwear dome tent for basecamp, and two are barrels of food (which I might even share with the others!). I’ve probably got around 25kg more than most of the other climbers – and whilst I know I could have packed (significantly) lighter, I also know that it’s good to try and make this experience as comfortable as possible, nice to have redundancies for some of the kit in case of loss or damage, and useful to be as self-sufficient as possible. Having your own independent power system for basecamp (2x 60W solar panels, courtesy of the polar legend Ben Saunders, and a large lithium battery back and charging unit) is certainly much easier than having to wait your turn to get 30 minutes to try and charge your iPod from the group battery pack. In some senses, despite the quality of the climbing equipment, tents and clothing being infinitely lighter than those carried by our predecessors a century ago, we just end up taking all sorts of bizarre new things that hadn’t been invented back then – I certainly can’t see the Duke of Abruzzi’s expedition photographer Vittorio Sella taking his pictures and film with a drone (like we have). Then again we aren’t taking multiple cases of cognac, champagne and fine claret like they did. I guess you win some, you lose some. One of the more tedious jobs of the day was sorting though the medical kit. Dan had brought a duffle bag full of ziplock bags overflowing with an assortment of random pills, lotions, potions and medical hardwear. Fortunately, Tomo has a medical degree, so was definitely the right man to be leading on the sorting. This involved checking expiry dates, discarding packets where the seal on pills had been broken and chucking anything that we thought was replicated (do we really need two stethoscopes and six thermometers?). 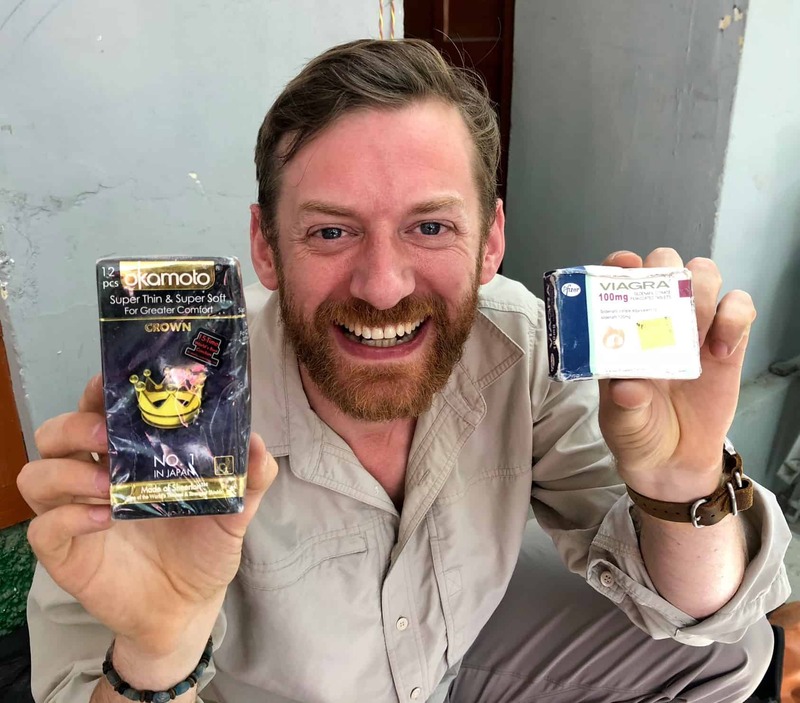 There was much amusement as we found not only condoms, but viagra – which although I’m sure there was a perfectly good reason for them being in there, we weren’t convinced they’d be that necessary on the mountain. Perhaps the viagra could be useful for enabling no hands ice-axe arrests…? Sorting through the first aid kit – slightly surprised to find condoms and viagra! We’ve split the kit down into a series of small bags which will stay in each camp on the mountains (both K2 and Broad Peak) as the respective teams establish them, and also a much more comprehensive basecamp kit (sans prophylactics…). We did need to go to the pharmacy to stock up on a few specific drugs which we were short on. Coming from a country where medicine is very tightly controlled, and anything of much significance requires a prescription, it’s amazing to see (a bit like India and a number of other countries) that you can essentially buy anything (short of actual opioids) over the counter without a prescription. It was a wonderful surprise to find out that my expedition cook from 2016, Zulfi, is our cook on this trip. Zulfi is a wonderfully gentle man from Skardu, and whilst his English is limited, his mastery of a kerosene stove means that he will no doubt keep us well fed over the next 7 weeks. Several of his assistant cooks I recognised from working for other teams in 2016, so it all feels like a rather special adventurous reunion! Zulfi and his team spent most of their time sorting out all the dry and non-perishable food that we’d need for the trek in, our time in BC and the trek out. There was over 100kg of rice alone, mountains of boxes of biscuits, hundreds of tins and jars, bottles and bags. It really is an amazing demonstration of culinary logistics! We’ll also be collecting perishable foods, such as eggs, fruit and veggies, frozen chicken (which comes all the way to BC in iceboxes! ), and inevitably a few goats, chickens and even a Zoa (half cow, half yak), which will all take a one way trip of a lifetime to basecamp. It will be quite a menagerie heading up the Baltoro later this week. I had to go and stock up on a few things from the local shops, including 380sq ft of foam underlay (to create a nice comfy carpet in the dome tent), some more antibiotics (just in case) and a very trendy new umbrella. As ridiculous as it might seem, umbrellas are a god-send during the walk in to basecamp, as they help provide some shade from the merciless sun during the first few days, and will then potentially provide some respite from the snow or even rain further up. All I need now is a bowler hat, and I’ll be cutting a fine figure of an Englishman on the walk in. 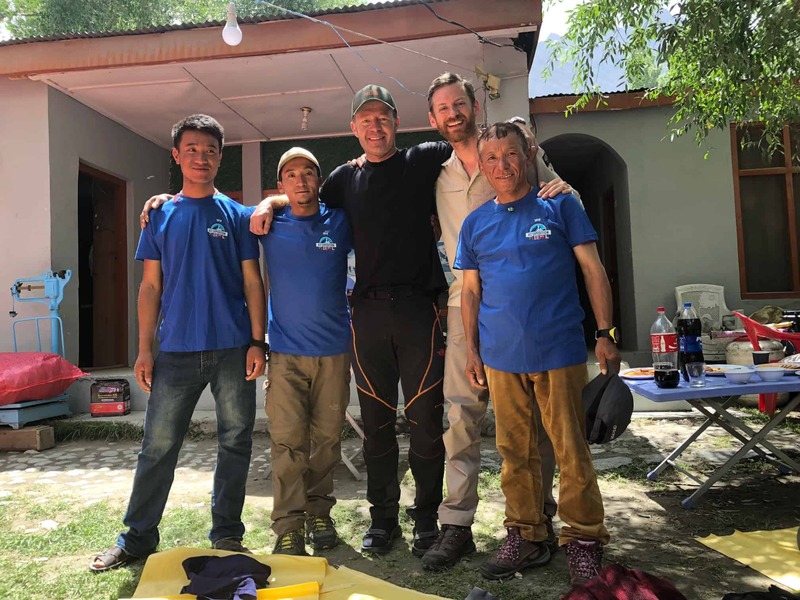 A large team from Dawa Sherpa’s 7 Summits Company has arrived today in Skardu (staying in the same hotel as us) – very please to bump into Noel, an Irishman who was on K2 with ‘MadEx’ back in 2016. This will also be Noel’s 3rd attempt – both of us agreed that we really needed to do our best to get to the top this time, as neither of us really want to have to come back for a forth time! The 7 Summits team have 13 members, and 14 Sherpas, so they constitute a very large team on the mountain – we on the other hand only have 5 or 6 in total for K2. We’re still waiting for our permits to be completed (getting local sign off), which our liaison officer, Sqn Leader Zaig Baig from the Pakistani Air Force assures us will be complete by 2230 this evening. Breakfast is planned for 0630 tomorrow morning, so all things being good, we’ll get in the jeeps and head off to Askole. Which means that this is the last email that I’ll send via WiFi for quite some time. Luckily I did test the BGAN (satellite data transceiver) this afternoon, and it does indeed work). Last night in a bed, last shower, last air conditioning for 7 weeks – but the misery is all part of the adventure! I must also not forget to wish my father Hugh a very happy birthday (and of course Happy Father’s Day for yesterday). You enabled me to turn a partial interest in climbing into a full-blown passion (some might say obsession) when you took me to climb Kilimanjaro when I was 15. Reaching the summit to watch the Millennium dawn on the 1st Jan 2000 was the most amazing start to my seven summits aspirations, and I have you to thank/blame for so much. Thanks for being awesome Pa – happy birthday!